Since 1995, ColorShadow has Been Finding Innovative Ways to Leverage Technology to our Clients’ Advantage. Millions of people use ColorShadow solutions every day. Our technologies help facilitate the shipment of tons of cargo across the ocean. They keep trucks on the road with the correct spare parts. You may even have enjoyed a pizza made just the way you like because our apps made sure the anchovies were on the left side (with extra sauce). ColorShadow empowers businesses to go further and faster than they thought possible. Whether your company needs a revitalization or realization of its online identity, or a complete IT Transformation or Business Acceleration Strategy - ColorShadow is your partner in technology. Click For More... The Canadian International Autoshow is among the world’s most influential autoshows alongside Paris, Detroit, and Tokyo. For over 10 years, ColorShadow was responsible for the creative, development and management of the official Consumer and Media websites. The Consumer website provided show information, e-marketing programs, online contests and manufacturer profiles integrated with a 3D interactive floor map. The Media website provided online media registration, top-line news, and an image library for automotive journalists around the globe. Click For More... Bell is Canada’s leading provider of information and communications technology (ICT) solutions for large enterprises. ColorShadow provided the creative and technical strategies, blueprint, design and development of a full-featured multimedia application in both online and software formats for Bell Enterprise Group. The application included dynamic content that was applicable to its audience, video and narration, 3D animation and downloadable PDF product specifications, as well as usage tracking and analysis. Click For More... INC Group houses popular brands including Fairweather, International Clothiers, Pinstripe Men, and Stockhomme, which collectively boast over 200 stores in Canada. ColorShadow was responsible for the creative, design and site architecture for each of these sites, including collections galleries and store locators, as well as mailing list collection, e-marketing campaigns, and online contests. Click For More... FGIworld has helped more than 2,200 organizations effectively manage the mental, social and physical health of their employees and families. ColorShadow provided consultation, design, development and management of FGIworld’s Corporate website and its “Clients Only” portal which includes an interactive e-counselling system, usage performance reporting, and Content Management System. Click For More... GE Lighting Division required an innovative method to market its Super Blue light bulbs product line. ColorShadow helped GE and its agency conceptualize, design and deliver a multimedia solution that contained videos, a custom-designed MP3 player, and 3D animation, wrapped in an interactive and robust interface. The International Summit Creative Awards named this application the winner in the 2004 Silver category for Creative Excellence. The prestigious Applied Arts Magazine awarded this Multimedia Application as the winner in the 2003 Corporate Multimedia category. Click For More... A luxury clothing retailer with 17 stores across Canada, Harry Rosen was looking for an e-learning tool for its sales staff. ColorShadow created an interactive tool that included puzzle and drag-and-drop quizzes, page flip navigation, video and PDF integration, as well as usage tracking and monitoring. ColorShadow was the winner of the 2008 Award of Distinction, Interactive Multimedia for Corporate Training at the 2008 Communicator Awards for this product. Click For More... A joint venture between Merck and H&T International formed Healthworks, which helps monitor a user’s health information and prescriptions while offering deals and coupons. ColorShadow is responsible for the consultation, design, development and management of the website and registration system, along with account storage for sensitive health information and a reminder system for prescription renewal. Click For More... The JUNO Awards is Canada’s annual premier awards show, a national televised event showcasing the best in Canadian music. ColorShadow was responsible for the entire build and ongoing management of all online properties, including the various sub-brands and events. Click For More... Lamborghini, a manufacturer of luxury sports cars with more than 120 dealerships worldwide, was looking to increase interactivity on its website. ColorShadow built an online commercial maker, powered by ColorShadow’s movie creator technology, which allowed users to splice together clips from Lamborghini’s footage and customize sound options to build their own commercials. Click For More... Loblaws provides the convenience of a one-stop shopping experience by collecting specialty departments and shops under one roof. ColorShadow designed and developed an interactive online resource library to manage all of the Loblaws branding elements: logos, product images, and packaging designs. This added considerable ease of use and all-important brand ID protection. Click For More... The Hamilton Port Authority is responsible for all national and international marine transportation in and out of the Hamilton Port in Canada. ColorShadow formulated and executed a system for shippers and suppliers to register and post their available cargo or capacity to make shipping more effective and economical. This included design, development, a dual registration system, and an admin system. Click For More... Patak’s is a leading producer of Indian sauces and condiments in over 17 countries worldwide. ColorShadow was responsible for the consultation, design, development and ongoing management of the consumer facing social media-friendly, responsive website for Patak’s Canada. The site includes recipe and product search views. ColorShadow was also responsible for email marketing campaigns and social media activities. Click For More... With over 40 franchises across the Toronto area, Pizzaiolo is rapidly becoming the "go-to" pizza franchise across Ontario and soon all of Canada. ColorShadow was tasked with the complete redesign and architecture of the entire Pizzaiolo online experience, their virtual ordering and fulfillment systems, and the complex integration with various third party technologies to enable order tracking and locational search in real time. With an immediate boost to the number of orders and a dramatic uptake in customer adoption through the seamless integration of a mobile-ready interface, Pizzaiolo is poised to build on their considerable success. Click For More... Purolator is Canada’s leading integrated freight and parcel solutions provider, handling 1.4 million transactions per day. Working closely with the client and its agency, ColorShadow was responsible for the consultation, development and management of Purolator’s online portal. This included the highly complex shipping solutions and delivery service options, as well as documentation and a resource centre. Click For More... The Shaw Rocket Fund has invested over $127 million in Canadian children’s television and digital programs and is recognized worldwide for its creativity and commitment to quality. ColorShadow is responsible for consultation, design, development, online marketing and social media, and overall management of their website. 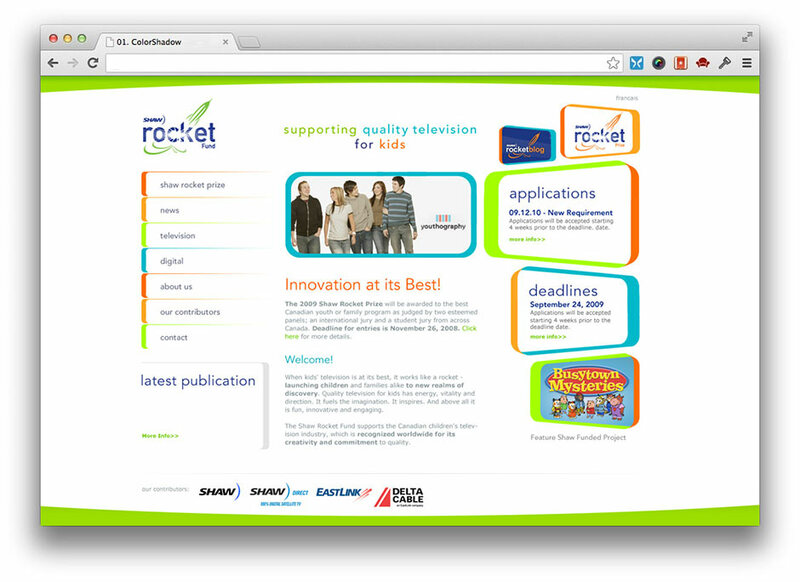 With the annual Shaw Rocket Prize, awarding top Canadian kids programs, an online application system including video upload and admin system was required, alongside a voting website with parent and child registration, voting capabilities, and video upload. Click For More... Sunoco is an American petroleum and petrochemical manufacturer. Prior to the merge of the Canadian division, Suncor Energy, with Petro-Canada, ColorShadow was responsible for Sunoco’s Performance Points online email marketing campaigns, including idea generation, design, build and send. Additionally, using ColorShadow's experience in email campaign management, the client was able to granularly track the performance of each communication in real time, adding considerably to the overall ROI. Click For More... Toshiba Canada is a diversified electric/electronic manufacturer who provides a wide range of products and services on a global basis, and is a Financial Post 500 company. The challenges of sharing branding images and logo assets resulted in incorrect usage and lost marketing opportunities for Toshiba Canada. ColorShadow built a secure online centralized Marketing Toolkit for Toshiba to share its product line logos, photos, images and marketing copy to all of its distributing partners, while maintaining the integrity of all brand positioning. Click For More... Volvo Trucks North America is part of the Volvo Group, headquartered in Sweden with products sold in more than 180 countries. With the challenge of distributing parts information in a timely manner to its North American fleet customers, Volvo Trucks required an integrated and innovative solution to deliver a client marketing support system. ColorShadow’s DMS is a unique web-based Catalogue and Ad Builder system that allows individual dealers to customize their own materials, and is one of the first of its kind in the trucking industry. Bell is Canada’s leading provider of information and communications technology (ICT) solutions for large enterprises. ColorShadow provided the creative and technical strategies blueprint, design and development of a full-featured multimedia application in both web and CD-ROM formats for Bell Enterprise Group. The application included dynamic content that was applicable to its audience, video and narration, 3D animation and downloadable PDF product specifications. Our clients are not simply “customers”, they are our partners in innovation and trusted members of our team. Let us show you how we can transform how you do business. From conceptualizing and fleshing out a basic idea, to gathering requirements and architecting the solution, we can help take that idea you scribbled on a paper napkin and build it, or even assist your tech team in your overall development cycle. As the touch points between your audience and technology become more complex, we take a holistic approach to engineering your solution, ensuring it is effective and relevant not only today, but capable of adapting to future changes. We help your business find value in the most unlikely places and enjoy change where there was only uncertainty. We make your work life easier, your productivity higher and your time more effective. ColorShadow consults in a variety of fields, including IT Transformation, Big Data, Process Management, Mobility, Globalization, Cloud, CRM, Analytics and Training. No matter what we are working on, you can be sure we work with you as a valued partner, not just a customer. While we strive to stay within your brand standards, we also recognize the web as a varying medium, one which sometimes requires a radically different approach. Design is not just about making things look nice; the effectiveness of your website's usability is a key success criteria for us. We embraced the paradigm shift to mobile usage and have been moving with the technological change to provide a variety of solutions for both mobile-first applications and responsive user interfaces. Mobile is where the world is headed, and no matter the smartphone, tablet or other mobile device, our solutions are delivering the best experience. Too much data, but not enough information? Isn't it time your company's deluge of data paid you back? We always work with the idea that the business with superior analytics will be the superior business. So don't be afraid of Big Data, we can help you contextualize the noise to create insight into your business performance and customer demands faster than ever before. We don't believe in "one solution fits all" - we use the one that's best suited to you. It will be one that delivers stability and performance, remains cost effective in ongoing management and, where required, integrates well with your existing systems. We have extensive expertise with both enterprise technologies as well as popular open-source technologies, and with our agile development approach we can deploy projects in record time compared to the traditional development cycle. So we finished architecting and building your new state of the art business solution. That does not mean our commitment to you ends there! We will either help or fully maintain the security, content, data, hardware and software building blocks of your business. We see ourselves as your partner; think of us as an extension of your Marketing and IT department all rolled into one. We don't even give you a cookie cutter Service Level Agreement; that, like the projects we guide you through, is also custom-tailored to suit your needs. To find out more about how our partnership can accelerate your business, please fill out the form below. We will get back to you as soon as possible. Thank you for taking a look at what we do and how we can help you. © 1995-2018 COLORSHADOW COMMUNICATIONS INC. ALL RIGHTS RESERVED.